I used to blog religiously. Every single morning of my life. I'm passionate about many things, writing, searching, telling stories, connecting and of course... people... to name a very small few. A public journal is sheer perfection for one who admittedly leans towards, at best, compulsive and at less-than-best, addictive. It all started with Myspace. However, Myspace proved to be a little unreliable... as did the audience... as did life. So, long story short, (famous last words.... never believe me when I say that... it usually means a long and excruciatingly detailed story is on the verge of spilling out all over the place) here we are at a new blog host, on a new computer, in a new town, in a new state with the same foundations in passion, quests, and magic, but with a whole new perspective. I’d like to think that it’s not all self serving though. With any luck we’ll have some good conversations, have an epiphany or two and share some laughs. So, Shades of Gray. In a convoluted way, over the course of a convoluted time in my life, it kind of morphed into my thing. I guess it defines a world view, a philosophy, an insight, and maybe even a morality. You see, I don't believe in absolutes. I believe that life is entirely too grand, in both essence and scale, to be broken down into definitive, bite sized pieces... good and evil, love and hate, passion and apathy, reality and fantasy, and even truth and fiction. Life is complex and in order to truly understand it, you must look for the nuance; you must seek out what lies in between the chasm of absolutes. Everything has both darkness and light... it is the combination of the black and white that makes the whole. 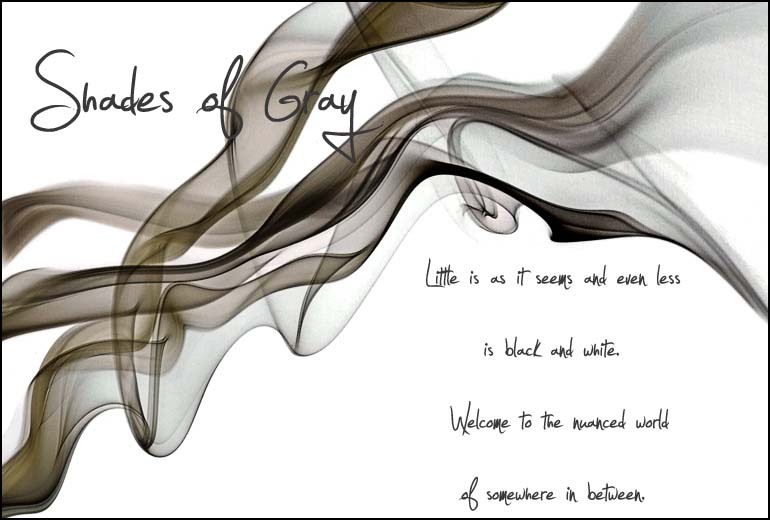 This blog will be my view of life through this philosophy, my quest for the whole, if you will.... my interpretation of the the shades of gray. I’m always amazed at how uncomfortable this philosophy makes people, but I’ve come to understand why. Bear with me for a few weeks… like most things I find myself stirring up, it might be awkward, occasionally uncomfortable, and maybe even slightly terrifying at first, but I swear to you, at some point you’ll look around and realize you’re having a blast. A final few notes on prose and then I will bid you adieu until the morning. I have no business writing with the on this side of the sky. I am an English Major and fully embrace every single corresponding cliché, down to the three Shakespeare anthologies (you can never have too many) sitting on my desk next to my Riverside Chaucer and antique, Victorian ink well. Despite my desire to be the cliché, I cannot spell worth a damn and generally don't pause for grammar like I should. My inner literary conscience (her initials are Professor S. P.) eats me alive inside, but she's very quiet and very forgiving and she makes incredible brownies so it works out. I have an infamously excessive and prolific repertoire of cuss words but don't think foul language looks pretty on paper, so please insert it often and creatively, should it be omitted. If it happens to appear, I really really mean it. Please feel free to comment! I spend a lot of time by myself... it’s nice to know you're out there ;) The only thing that I ask is that you keep an open mind. Lots of different world views, over all same goal.